Several decades of experience in the area of aluminum, a consistent quality policy, innovative product development, customer orientation and a reliable supply service from the foundations on which we have built our company into a know-how leader in the field of PREMIUM ALUMINIUM SYSTEMS. As an owner-managed family business, we think in terms of generations and set ourselves exceptionally high standards. Short term quarterly thinking and shareholder value does not enter our vocabulary. STEMESEDER stands for quality, innovation, short decision-making paths and sustainability, and not for short-term profiteering. PREMIUM – a word which is used too often these days. At STEMESEDER, the word “premium” is an integral part of our company philosophy – the ultimate goal of all our efforts for achieving the optimum product. At STEMESEDER, however, premium does not mean more expensive, more elaborate and more complicated… it simply means better! Modern owner-builders, architects, and renovators attribute value to natural and cozy living. Those who don´t want to go without attractive designs, durability, and ease of care when choosing a window decide on products from STEMESEDER. 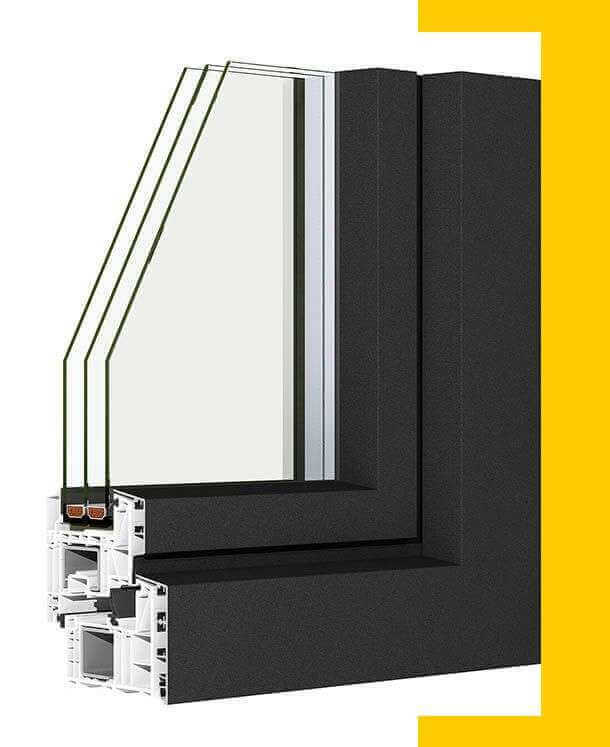 In combination with the GS window sill system PQS, the new GS Premium®, GS Centurio®, and GS Stratos®, systems set new standards in terms of quality and technology. 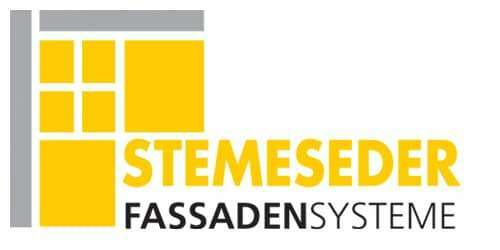 These systems from STEMESEDER are available in a variety of GS-Premium color tones and almost ever RAL color or the color of your choice. Wood is nature at its most pure. Wooden windows convey warmth and comfort. They guarantee a natural and cozy living. Wood-aluminum windows offer all of these advantages because when seen from inside your home, they do not differ from classic wooden windows. Wood is nature at its most pure. Wooden windows convey warmth and comfort. They guarantee a natural and cozy living. Wood-aluminum windows offer all of these advantages because when seen from inside your home, they do not differ from classic wooden windows. The STEMESEDER wood-aluminium systems increase the lifespan of your windows decisively and give your real estate added stability of value. 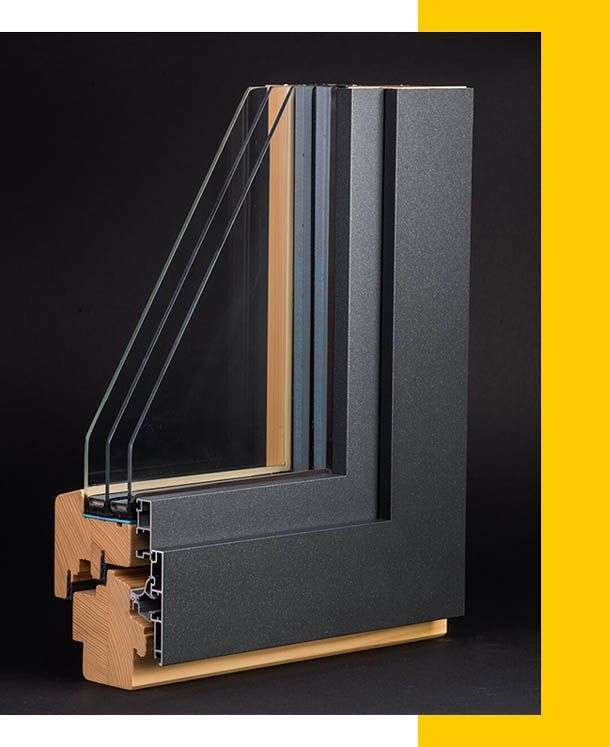 Admittedly: The high-quality wood-aluminum windows from STEMESEDER are a luxury item – but an exceptionally practical and highly affordable luxury item. The externally fitted STEMESEDER wood-aluminium system means that painting your windows is no longer necessary! The premium aluminum systems from STEMESEDER come supplied with the beneficial GS Premium® surface. The GS Premium color tones are distinguished by this highly weather resistant surface and provide a sense of long-term elegance. If the building is situated in a coastal area with a high airborne salt content or near roads that are salted heavily in the winter, we recommend our specialist »Seaside Protect« surface treatment. Wood is a natural product and can be adversely affected by the sun, wind, and weather. Wooden facades and conservatories, therefore, need a lot of care and have to be painted on a regular basis. 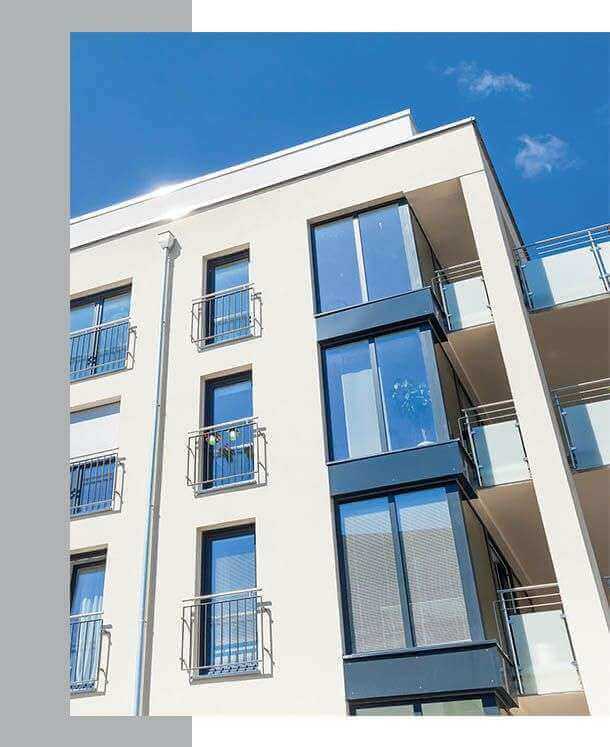 This is when the modern material of aluminium comes into its own: The externally fitted facade system from STEMESEDER provides your frame and beam facade with permanent protection. It is naturally the case that our facade system can also be applied to different supporting constructions. The dream of eternal youth becomes a reality! The GS Easy® system combines highest quality materials, best processing and an indestructible coating with a GS Premium surface. G.S. STEMESEDER guarantees your plastic windows an attractive appearance which is not transient and offers you an almost unlimited variety of colors. Combine the GS Easy® system with the wood-aluminum-, facade- and window sill systems or with your own, individual door panel. STEMESEDER avoids unnecessary coordination work and color matching. All of the premium aluminum systems from STEMESEDER come with the same surface quality! Stemeseder Premium PQS – simply impermeable! Our newly developed window sill system is the optimum solution for those with the highest aspirations in terms of function, quality, and visuals. The system-spanning integration of a perfect sealing system impermeable to driving rain between the window sill, window and masonry was the key development goal. Together with the unbeatable GS Premium surface quality, the huge variety of colors and a superb price-performance ratio, PREMIUM PQS is the first choice for builder-owners seeking premium quality products. What makes the SLIDING-SEAL PREMIUM PQS aluminium closure so special? 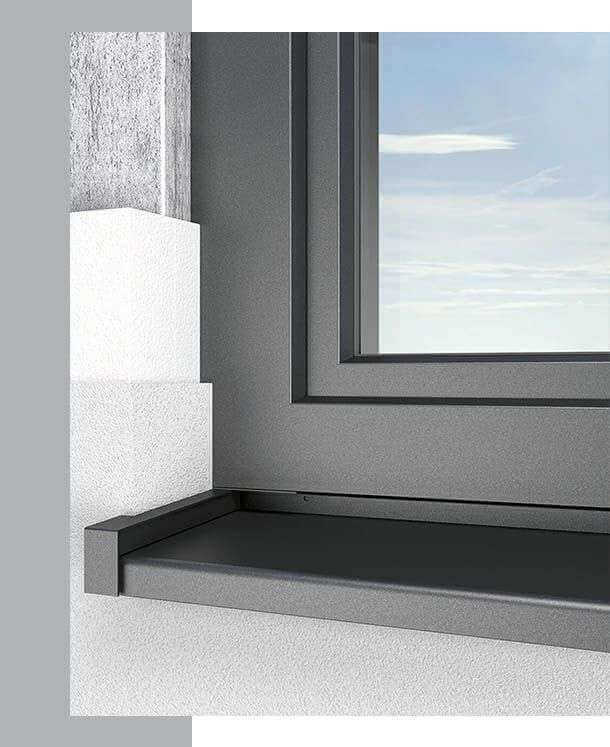 The thermal expansion of the window sill is absorbed in the sliding closure without damaging the building structure. Perfectly flush with masonry: Certified as impermeable to driving rain at 1.950 Pa with a non-aerated facade. Simply impermeable – no further sealing measures required! DESIGN – to suit practically every taste. The aluminum entrance doors from STEMESEDER are available in a variety of designs – from sleek and modern, to traditional Alpine styles. Are you unable to find a design that matches your aspirations? That’s no problem at STEMESEDER – just design your own door. Combine it with the GS Premium color tones – which are naturally highly weather resistant. Whether it is elegant gray, natural color tones or a wood decor that is deceptively realistic: The individualized door slots in which the design of the house harmoniously, and is the perfect match with the windows, window sills, conservatories and frame and beam facades. STEMESEDER supplies door panels for wood-aluminum, aluminum, and plastic front doors. When it comes to quality, especially demanding aspirations are attributed to front doors. To manufacture the best possible surface quality we use the latest high tech coating systems which enable completely homogeneous surfaces of absolute perfection under controlled clean room conditions – including large-scale surfaces! Our product range now includes >500 design versions. For this reason, individual designs pose no problem for us. 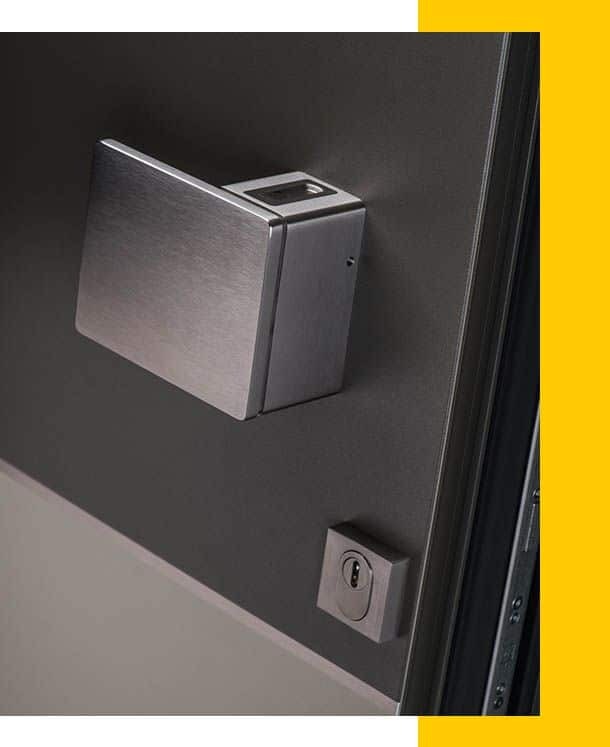 STEMESEDER can supply the optimum designer door panel for every situation and suit every taste – designed individually to suit customer requirements. 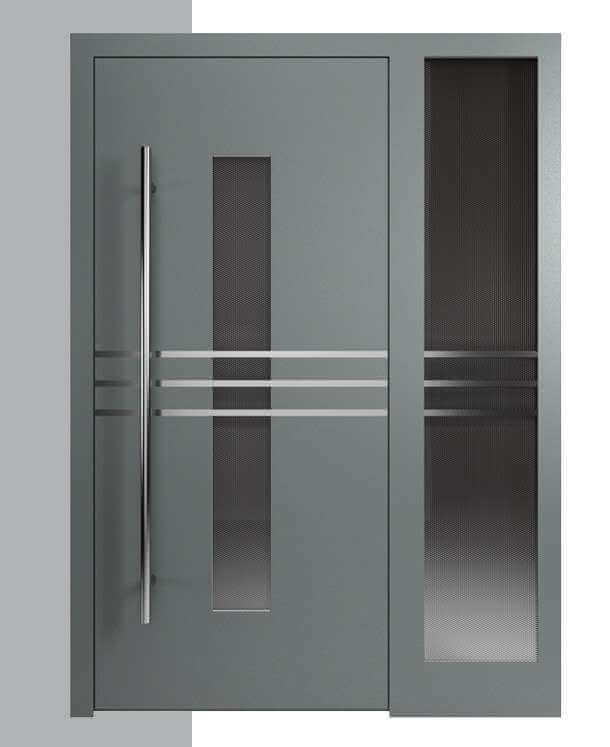 It goes without saying that our designer door panels match with all of the additional premium aluminum systems that our company offers – for the overall visuals of a construction project, the perfect synergy of all the individual components is ultimate of decisive importance. Questioning the status quo and setting new standards with innovations. It is with this philosophy that we have become a know-how leader in the area of wood-aluminium systems. We don´t do things by halves – which means we believe a successful partnership starts with the development, encompassing optimum support and advice as well as a rapid response customer service. We define quality to mean responsibility and obligation in terms of both our own high standards and – in particular – our customers’ requirements. We combine our efforts to achieve the perfect system solutions with our longstanding customers. The professional technical advice provided by our experienced application engineers and our continuous further development ensure our high technical standards. The ultra-modern manufacturing at STEMESEDER is a further guarantee for durability and perfect functioning. As an owner-managed family business, at STEMESEDER we stand up for every product that leaves our company with our good name. For this reason, we always prioritize quality, sustainability and long-term partnerships over making a quick buck. Or please fill out the form to contact us.